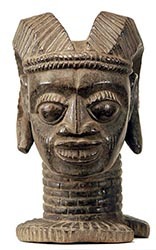 The Yoruba heads above have been vetted as authentic with signs of use and age. 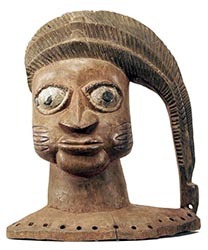 Despite their appearance the Yoruba heads below show no evidence of age or use and were probably made to be sold. 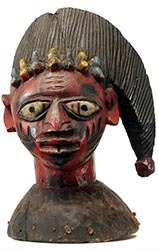 Most of these heads have the form of Egungun headdresses. The word Egungun refers to masking associated with honored male lineage ancestors. 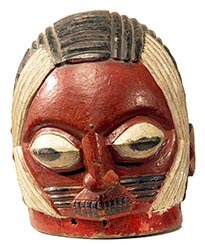 While each mask has a personal name, it does not usually refer to a specific ancestor. 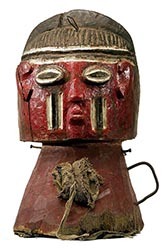 Rather, Egungun masks embody the "collective force of the ancestors. All of the Egungun in a community appear annually during a joyful festival that celebrates the distinguished dead. During the festival, the ancestors bless the living, promote physical and spiritual health, settle disputes, enforce tradition and morality, and cleanse the community of witchcraft. 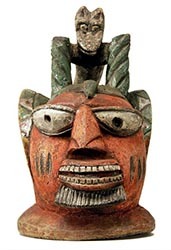 --from African Shapes of the Sacred: Yoruba Religious Art by Carol Ann Lorenz, Senior Curator, Longyear Museum of Anthropology, Colgate University.